A very warm welcome to the Chinese National Day Reception! This is the eighth national day reception I have hosted in London. I am delighted to have you all with us this evening to celebrate the 68th anniversary of the founding of the People's Republic of China. It's also interesting to note that, according to the Chinese lunar calendar, today is the sixth day of the eighth month. In the Chinese culture, six and eight are lucky numbers. They are believed to promise good fortune and bright prospects. With this wonderful and pleasant coincidence, our gathering here with so many friends, old and new, made our national day celebration even more enjoyable and memorable. 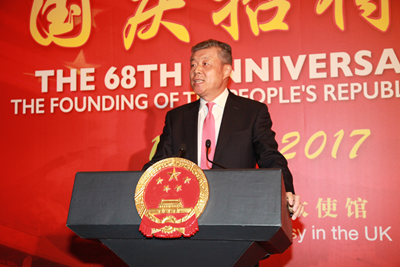 For China, 68 years have been a journey from being weak and poor to gaining independence and becoming prosperous. It has seen China's historic leap forward, in which the nation has got up on its feet, set out to achieve prosperity and grown from strength to strength. The most rapid and spectacular progress was achieved in the past four decades since China began its reform and opening-up. China has become the second largest economy, with significantly bigger role and influence in the world. More recently, the Eighteenth National Congress of the Communist Party of China five years ago set out the "two centenary goals" and mapped out the blueprint for achieving the "Chinese Dream" of national renewal. The past five years have been a witness to how the Chinese nation was making vigorous efforts and moving ever closer to these grand goals. For China, these five years have been extraordinary. These have been five years of continuous success in China's domestic reform and development. These have been five years of significant gains and happiness for the Chinese people. These have been five years of exceptional contribution of China to world peace and prosperity. In these five years, we have solved many difficult problems that we had long hoped to solve. We have achieved many great things that we had long hoped to achieve. I would like to summarize these five years with five "big's", five "new's" and five "achievements". First, big shift in growth model, new growth engine for the world and achievement in building a "prosperous China". Over the past five years, China has been focusing on innovative, balanced, green, open and inclusive development. We have been trying to understand, adapt to and lead the economic "new normal". A key point is to press ahead with the supply side reform. And there has been much success. China has maintained growth at a medium-to-high speed. Growth in the first six months of this year continued to lead the world at 6.9%. China's economy has enjoyed a strong, self-sustaining momentum thanks to improved efficiency and better structure. China has been contributing over 30% of global growth. This has made China undoubtedly a key engine for world growth. Second, big improvement in livelihood, new journey towards a moderately prosperous society and achievement in building a "happy China". Over the past five years, China has continued to give top priority to responding to the people's needs for a better life. On poverty reduction, we have put in huge efforts and brought 66 million people out of poverty. Our target is to eradicate abject poverty by 2020. On jobs, we have created 64 million urban new jobs. This is almost equivalent to Britain's total population. On infrastructure, we have added nearly 1.2 million kilometres to rural road network. That is long enough to go round the equator about 30 times. On conservation, we have devoted a considerable part of our efforts to improve and conserve the eco-environment and to encourage low carbon and sustainable development. Third, big strategy to advance rule of law, new chapter in strengthening Party discipline and achievement in building a "rule-based China". Over the past five years, China has been advancing the rule of law in every aspect. We have optimized the legal system and improved social justice and fairness. The exercise of the power of government is completely under the rule of law. In total, we have made or revised 48 laws, 42 administrative regulations, 2,926 provincial ordinances and 3,162 ministerial rules. The general provisions of civil law have been promulgated and the process of compiling a civil code started. More importantly, a series of tough measures have been taken to strengthen Party discipline and crack down on corruption. Efforts in this regard have consolidated the political groundwork for the advancement of various causes across the board. Fourth, big agenda in opening-up, new possibilities of the Belt and Road and achievement in building an "open China". Over the past five years, China has been embracing the world. From the Yanxi lakeside gathering of APEC leaders in Beijing to the G20 summit by the West Lake in Hangzhou, from the establishment of trade zones to better access for foreign investors, China has demonstrated a level of opening never seen before. China is now the world's second largest investor. China is the largest trading partner of more than 120 countries and regions. China has established eleven free trade pilot zones throughout the country. In May this year, China hosted the successful Belt and Road Forum for International Cooperation. This high-level gathering produced a five-category list of deliverables which includes 76 agreements and 270 outcomes. The Belt and Road Forum is a manifestation of China's readiness to share its development opportunities with countries along the Belt and Road routes and beyond. It sends a welcoming call for everyone to get aboard the express train of China's fast growth. Fifth, big blueprint of peaceful development, new diplomatic concepts and achievement in building a "peaceful China". Over the past five years, China has played an active role in maintaining world peace and promoting global development. We have contributed the China wisdom, China solutions and China strength. We have proposed the concept of building a community of shared future for mankind. This includes China's vision for global governance, development, security and globalization, as well as our approach to justice and interests. We have announced the one-billion-dollar China-UN Peace and Development Fund. We have established the South-South Cooperation Fund on Climate Change and another South-South Cooperation Fund to assist developing countries in implementing their post-2015 development agenda. On peacekeeping, China has created a full-unit police force and an 8,000-strong emergency standby team. Early this month, China successfully hosted the ninth BRICS Summit. The meeting gave new impetus to advancing peace and development, deepening BRICS cooperation, improving global governance and driving world economic growth. This year marks the 45th anniversary of the Ambassadorial diplomatic ties between China and Britain. 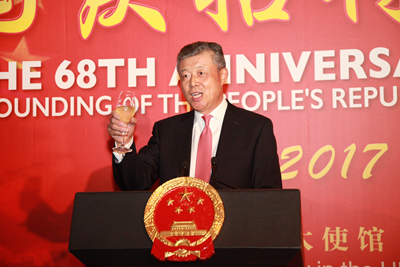 It is also a year for consolidating the China-UK "Golden Era". For China and Britain, the past 45 years have been extraordinary. Britain was the first major western country to recognize the New China. China and Britain worked together creatively and resolved the question of Hong Kong. We upgraded our ties to a global comprehensive strategic partnership for the 21st century and heralded the China-UK "Golden Era". These are some of the latest milestones of our bilateral relations. They are fine examples of China's relations with major western countries. We are living in an interesting time. Both the international and regional situations are undergoing profound and complex changes. Brexit is bringing uncertainties and instabilities. However, we must not lose sight of the general direction of China-UK relationship. 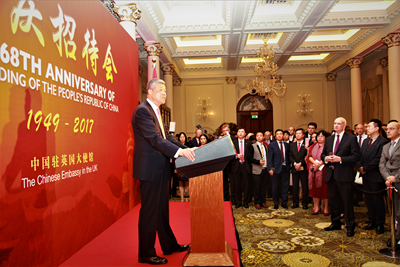 Our shared commitment to China-UK "Golden Era" remains unchanged. The win-win nature of China-UK bilateral cooperation remains unchanged. And the strategic and global significance of China-UK collaboration on international issues remains unchanged. China-UK relationship has been growing steadily. China-UK relationship has huge, untapped potential. Like many of you present here today, I am fully confident about the future of China-UK relations. The key is to turn confidence into actions and turn potential into success. To this end, I think there are five opportunities we need to grasp. President Xi Jinping's successful state visit to Britain in 2015 heralded the "Golden Era" in our bilateral ties. At the G20 Summits in Hangzhou and Hamburg, President Xi and Prime Minister May emphasized the importance of the China-UK "Golden Era". Today, President Xi and Prime Minister May held telephone talks, in which the leaders once again reaffirmed our shared commitment to building the "Golden Era". Building a China-UK "Golden Era" is not a slogan. It is a brand new definition of our bilateral relationship. It is a symbol of our determination to build consensus and deepen cooperation. We must seize this opportunity. We must engage each other in productive dialogues. We can deliver more "golden fruits" in this "Golden Era". The second opportunity comes from China's development. China is striving for national progress and renewal. The dynamics between China and the rest of the world is undergoing profound changes. Already, we have seen China's development creating opportunities for countries around the world. One of the examples is the Belt and Road Initiative. This Initiative offers a platform for countries to share China's development benefits and work together for win-win results. More than 100 countries and international organizations are participating in this Initiative and working actively together. Britain is one of them. Enthusiasm from different sectors can be felt across this country. China's development will provide more opportunities. In the coming five years, China will import 8,000 billion dollars of goods, attract 600 billion dollars of foreign investment and make 750 billion dollars of outbound investment. Chinese nationals will make more than 700 million trips overseas. All these will create huge opportunities for closer China-UK cooperation across the board. The third opportunity will arise from dovetailing development strategies of our two countries. China and Britain have much to offer to each other in our respective development strategies. Right now, China is working hard to dovetail the Belt and Road Initiative, the 13th Five Year Plan and the Made in China 2025 with the UK's Industrial Strategy, Northern Powerhouse and the UK Industry 2050. We are working with Britain to expand our cooperation into infrastructure building such as new energy, high speed rail, airport, etc. Britain is strong in high-tech, financial services and creative industries. China has capital, human resources, a huge market and leading infrastructure building capabilities. Our two countries can put our respective strengths together, engage in closer cooperation and achieve common development. The fourth opportunity lies in the extensive, friendly exchanges between China and Britain. Recent years have seen increasing cultural and people-to-people exchanges between our two countries. 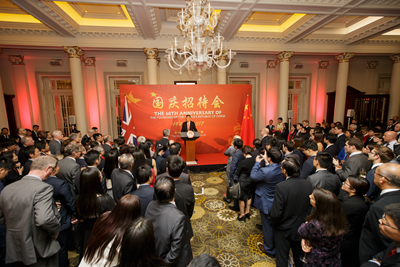 Together, we hosted the China-UK Year of Cultural Exchange. We co-hosted events to commemorate the 400th anniversary of the passing of Tang Xianzu and William Shakespeare. In the field of education, about 170 thousand Chinese students are right now studying in the UK. More than 130 thousand British students have been registered at the 29 Confucius Institute and 145 Confucius Classrooms across the UK. This has made Britain a leader in Europe in both student exchange and Chinese language teaching. Tourism is another highlight. In 2016, Chinese and British nationals made 1.5 million visits to each other's country. That is 50% more than five years ago. Greatly facilitating such level of mutual visits is the increase of passenger flights between China and Britain to 100 flights per week. Such level of close cultural exchanges and people-to-people ties is certainly contributing to stronger public support on both sides for China-UK relations. Last but not least is the opportunity for cooperation between China and Britain on international issues. China and Britain are countries of global influence. Both China and Britain are permanent members of the UN Security Council and important members of G20. We have maintained sound cooperation within the framework of the UN and G20. We have made joint statements on Syria and Afghanistan. And we have been engaged in global cooperation on health issues, climate change, counter-terrorism, peacekeeping and regional security. The telephone talks between President Xi and Prime Minister May is the latest example of China and the UK joining hands in responding to global and regional challenges. The two leaders agreed that China and the UK, as permanent members of the UN Security Council, have the obligation and responsibility to handle hot spot issues such as the DPRK nuclear programme in a way that upholds regional and international peace. As we celebrate China's 68th National Day, another major event is drawing near. That is the 19th National Congress of the Communist Party of China. It is to be held in Beijing on 18 October. This will be a highly important meeting. The timing is important. China is right now in the run-up to the realization of a moderately prosperous society. It is also a crucial time for the development of socialism with Chinese features. The agenda is important. This meeting will review China's overall progress in the past five years and draw lessons and experience. On this basis, it will make action plans and design fundamental policies that are forward-looking and in keeping with the times. On the whole, this will be a meeting that will help make sure the giant ship of China will continue to ride the waves and go full steam ahead. As an old Chinese saying goes, "A partnership forged with the right approach defies geographical distance; It is thicker than glue and stronger than metal and stone." It is my firm belief that we should take China-UK relations from a strategic and long-term perspective and we must seize the five opportunities I mentioned just now. If we do so, we can build an enduring China-UK "Golden Era" with more remarkable achievements, with a more promising future and with more "golden fruits" for our people and the people of the world. And to the peace and prosperity of the world.